We wanted to highlight what Manolo is doing with his two bamboos which may not be as clear when you do not see images side by side. As you can see, he is working with the diagonal pairs. The goal is to develop the horse so that in time he will travel in self carriage, in a good rhythm and tempo, with regularity while using all his joints and muscles equally so that one leg or pair of legs or one side of the body is not working harder then the other which is how horses break down. This is developing, improving, refining, in a word, it is schooling and educational. Note that in this work, bamboos should be very thin and dry. A handler should NEVER use thick or rigid canes or thick, green bamboos which would be akin to using broom handle to work with the horse. Furthermore, this work should not be asked of horses who are not physically ready for it. A horse should already be quite straight, supple, and strong before we ask because piaffe, passage, pirouettes are not a trick, they demand great effort from the horse. We must teach this work progressively, in small sequences with a lot of moving forward in a lengthened frame in between so the horse’s muscles and mind can relax and loosen. Horses should learn to welcome this work, not dread it. The bamboo is like the orchestra’s conductor’s wand. It is meant to suggest, touch, tap, organize, activate, never hit hard, hurt or force the horse. Manolo likes to sometimes split the ends of his vertically (1 inch slit) so they make a noise when then the horse touches it with its feet and spectators will notice the horses rather like the noise and hitting the bamboo. This helps create rhythm, something horses have an innate hear for. A good handler makes the bamboo the horse’s friend. The more the horse can use his neck, the better the balance, regularity and action of the diagonal pairs. 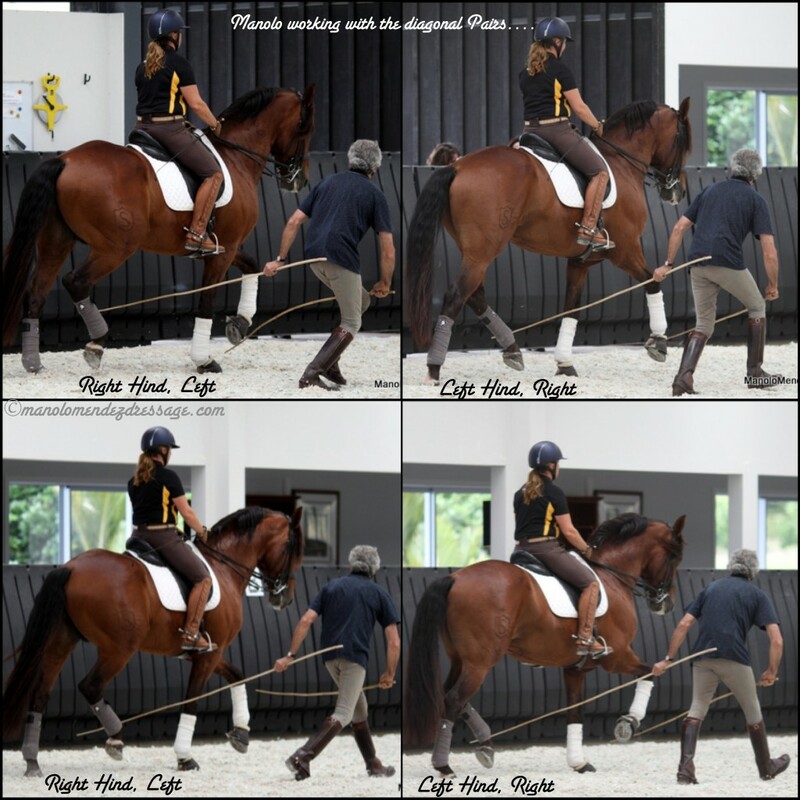 While Manolo’s introduction to in-hand work DVD and Vimeo online content does not teach this very advance work, it provides the foundation for understanding horses bodies and minds better, timing and posture. Precision and respect which can in time lead a handler to understanding what is needed and when to help a horse with these movements without causing fear, pain or stress. These are images of FEI rider Jody Hartstone on her GP Lusitano stallion Ali-Baba in a lesson with Manolo at a January clinic in New Zealand. These have been shared on Ali-Baba’s page. NOTE: We are grateful for any rider who is open to sharing their learning experience with others. Not every rider FEI or not is so generous. 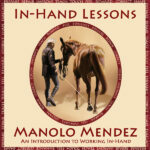 You can purchase Manolo’s DVD at In-Hand Lessons on Vimeo or on this site.